Flying Saucer is for advertising purposes only. Walter Galonska, left, of Germany, spent a year building it. Since free-flying machines are verboten to Germans, Galonska anchors it with a steel cable. An electric motor drives the two contra-rotating propellers. 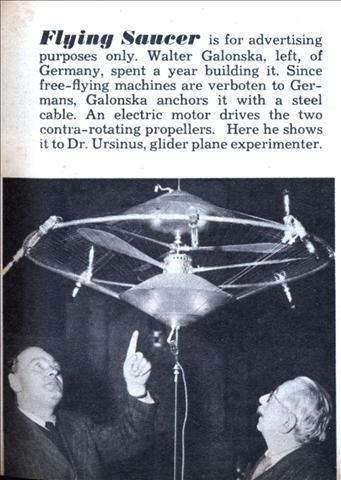 Here he shows it to Dr. Ursinus, glider plane experimenter. I wonder when it came legal for the Germans to resume powered flight– perhaps in the mid fifties. I would imagine Japan was under a similar restriction at the time. Kosher Ham: Civilian flight was restricted, not totally banned. R&D was forbidden during that era. Military flights resumed in 1955, when West-Germany joined the NATO. In Japan it was lifted in 1952. Or that’s what the web claims. That sounds right for the dates of the respective peace treaties. Everyone remembers the end of WW II (the surrender), however the war is not completely over until the peace treaty is also signed years later.